BIOLOGICAL SCALING. The smallest microbe and the largest mammal have something in common. Based on their relative body size, they have the same rates of metabolism. Similarly, a frog’s legs grow in direct size proportion to its body. This simple relationship does not always follow, as small changes in the body size of the Hercules beetle lead to a disproportionately large increase in the dimensions of its legs and antennae. Interest in comparing the relationship between one body part or biological function to the size of the entire body can be traced back to about 1900 when the French physiologist Louis Lapicque compared the brain size in a number of animal species to their body size. In 1924, the English evolutionary biologist Julian Huxley measured the relative growth rates of the large claw of the fiddler crab (Uca pugnax) to its body size at different stages of development, and noted that the claw size was growing at a proportionately greater rate. He developed a mathematical formula to describe this relationship and continued to study biological scaling over the next dozen years. To avoid confusion and bring a state of coherency and mathematical consistency to these studies, in 1936, Huxley and Georges Tessier, who was independently working in this area, published joint papers—one in English, the other in French—in the premier journals in their respective languages. In these papers, they introduced a new neutral term—allometry (“different measure”)—to refer to changes in the relative size of one body part to the overall body size. The term allometry has been expanded to now include such relationships as body size and basal metabolic rate (BMR), the metabolic rate of a resting organism. In 1932, the Swiss biologist Max Kleiber determined that elephants had lower absolute BMRs and heart rates than mice but, when their body mass was considered, the BMR was a constant ¾ power of body mass. Using Kleiber’s law, this same BMR relationship was subsequently shown to exist from tiny microbes to elephants, suggesting a common evolutionary link. SEE ALSO: Metabolism (1614), Energy Balance (1960). Unlike some animals, a frog’s legs grow in direct size proportion to its body. 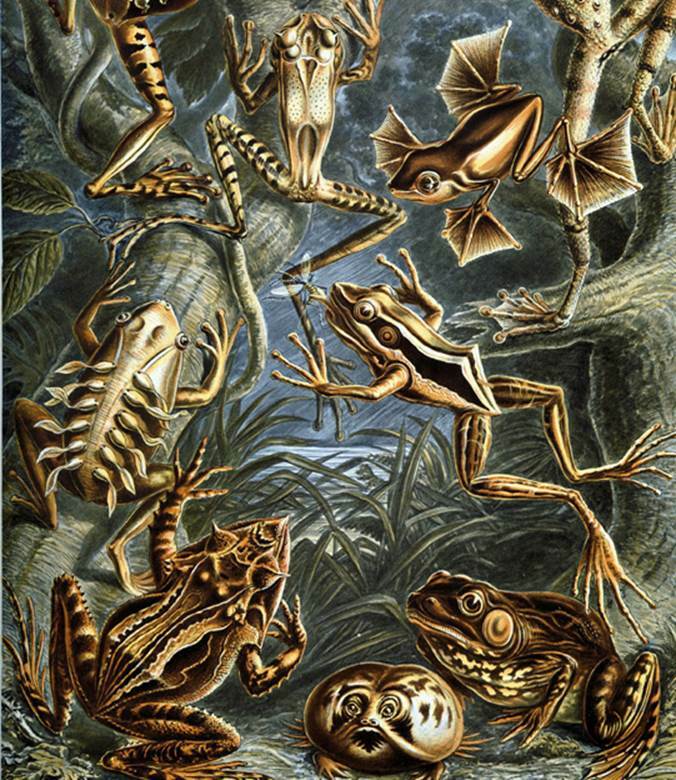 This illustration of different species of frogs comes from Ernst Haeckel’s Art Forms of Nature (1904).